Goat fences are not to be taken lightly since goats have been compared to creative escape artists. Goats will climb or try to run through a fence at the first possible chance. They’ll even stick their head through the fence or start chewing away, further compromising the integrity of the woven wire goat fence. 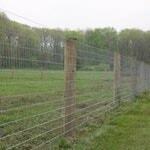 The fence is the only barrier between your livestock running away or any predator getting in. 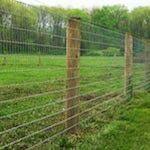 Woven wire goat fence is the fence that will get the job done repeatedly for many years to come. Good quality materials cannot be stressed enough. The return on the expenditures will come to you in no time when you’re not wasting precious time chasing escaped goats. 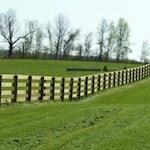 When working with woven wire goat fence installation, our experience is unparalleled. 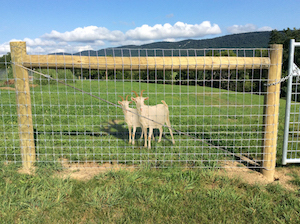 We know how to keep your goats from getting loose and the woven wire goat fence installation is where it all begins. 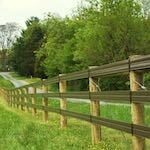 Since 1993 we have hashed out every detail when building woven wire goat fences. From the solid braces to the sturdy posts to the high-tensile woven wire, we have the knowledge that only comes from experience. 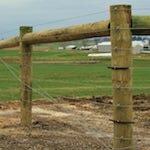 Watch the beginning stages of a woven wire goat fence being built below. 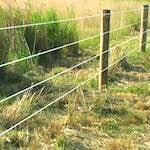 We invite you to fill out our Woven Wire Goat Fencing Quote, it’s the first step to getting the fence you need and deserve.